New York Times best-selling author and professor of Social Work at the University of Houston, Brené Brown, has written a powerful and inspiring book. 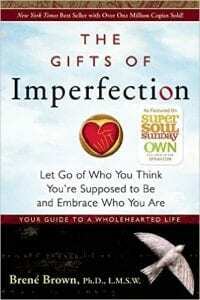 It explores how we can cultivate courage, compassion, and connection to embrace our imperfections and recognize that we are enough. Every day we are flooded with images and messages from society and the media. They tell us who, what, and how we should be. They sell perfection as the norm. From photoshopped images in magazines to advertisements for beauty products and surgery, we are encouraged to look better, younger, and (supposedly) happier. Failure is never an option. The expectations of doing it all, having it all, and being it all are very real pressures in today’s society. This sets up a pattern in our lives of performing, pleasing, comparing, and feeling like we can never measure up. This belief also intrudes into our relationships. We come to expect the same standards of others and feel frustrated when they’re not living up to our unrealistic expectations. Her message is “you are enough and you are worthy of love and belonging even if you don’t look a certain way or accomplish the expectations of others for your life.” Starting with this core belief, we can identify our values and what is important to us. We can live authentic and wholehearted lives, while cultivating the valuable character assets of courage, compassion and connection. If this book is resonating with you, do yourself a favour and read it.